This is a fun quick project and a great way to end the week. The vanity chair is one of a pair I bought at the Nashville Flea Market in December. I’ve been reorganizing and de-cluttering this week and I decided to paint one of the chairs for the granddaughters bedroom. I used a chalky spray paint and the color is waterfall. The instructions on the can suggested a temp below 50 degrees was definitely not optimal for spraying paint. Can you see the ice formed on top of the water in the kids sand thingy in the background. The temp in Clarksville was a little less than 50 degrees. I’m such a rebel. When I want to do something….I want to do it right then. 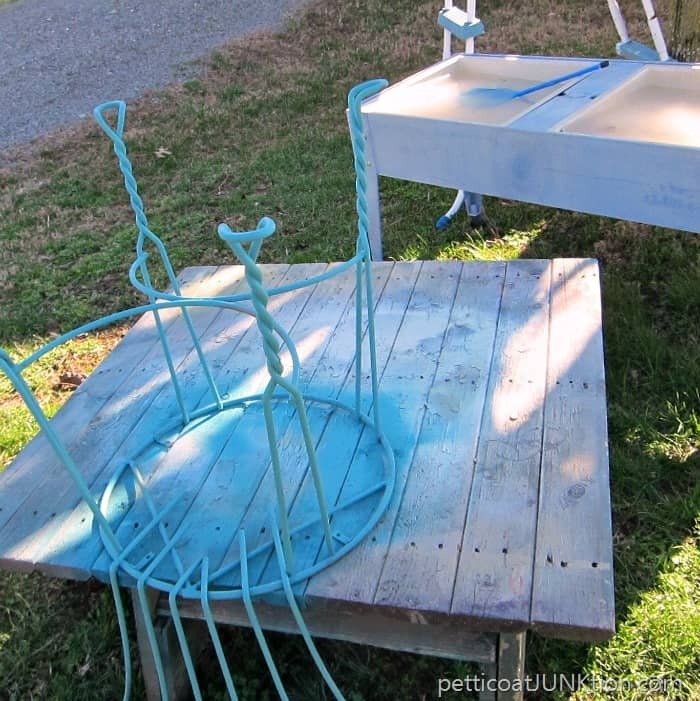 I originally envisioned using turquoise faux fur on the seat and spray painting the metal frame a contrasting color but I couldn’t find turquoise fur. We only have one fabric shop in Clarksville and I didn’t want to wait on an order to come in. I spotted the off-white fur and it was sooooo soft I couldn’t resist it. It doesn’t show in any of the photos but there is a bit of pale gold on the tips of the faux fur. I cut the fur and stapled it to the seat. 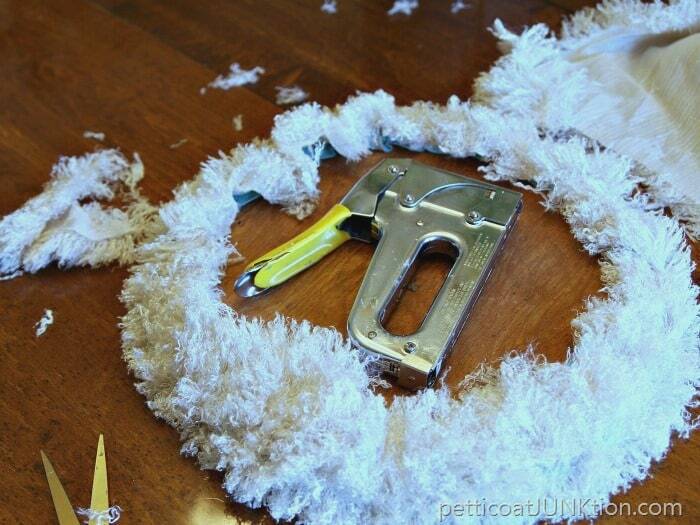 That fur stuff went everywhere! I screwed the seat to the chair and that was it. Oh yeah, I distressed the paint job just a little. I will be sharing more of the granddaughters room in a couple of weeks. I believe I mentioned I’m in de-cluttering mode? I plan to share photos of the before and after of the de-cluttering and organizing of each room as I finish them. First up next week is the back guest bedroom. See you then! Have a great weekend. Oh!!!! Looks fabulous!!! I will be on the look out for chairs like that now!! Thanks for sharing! 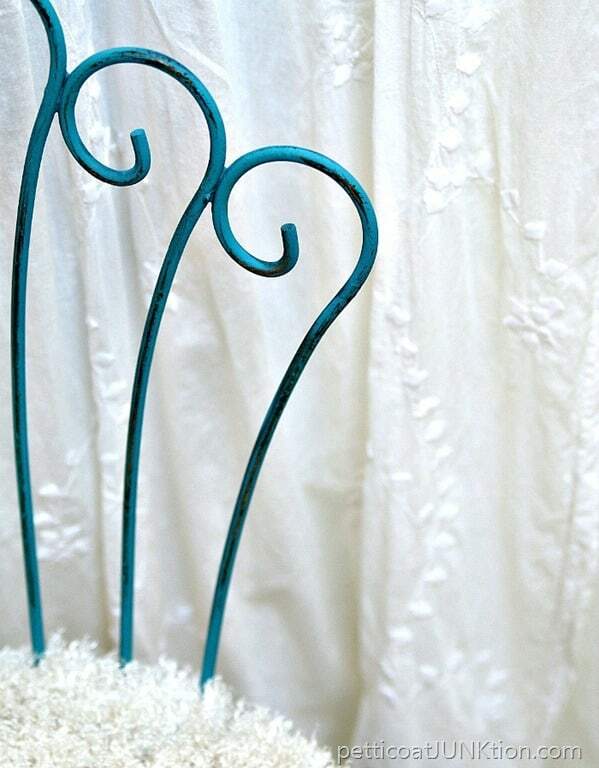 Such a sweet little chair in a cute vignette! This is an amazing idea! Thanks for sharing. 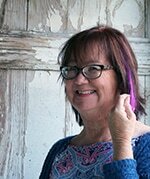 Hi, I’m Anita visiting from Artsy-Fartsy Link Party. I love this!! 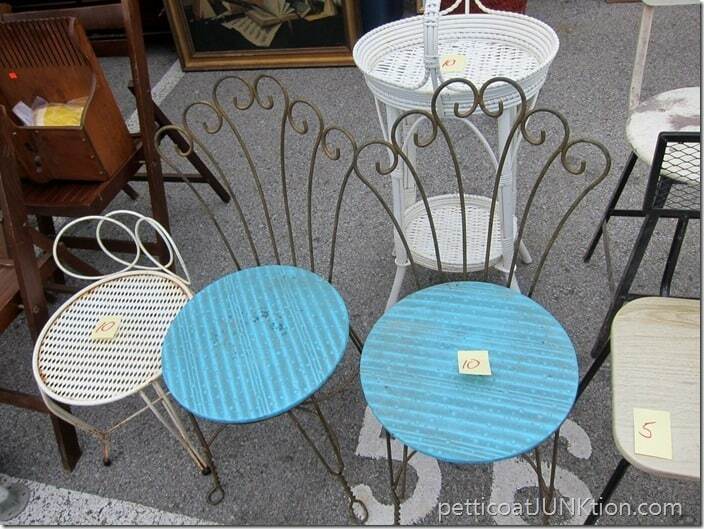 Makes me want to shop for an old chair now! 😉 Would love to see you at my craft party which is new Thursdays at 7pm EST. Have a great rest of the week! What a fresh and fun update! I’m sure your granddaughter with love it! Thanks for sharing with us at #MerryMonday! I love this so cute, thanks for sharing this on Dream Create and Inspire. 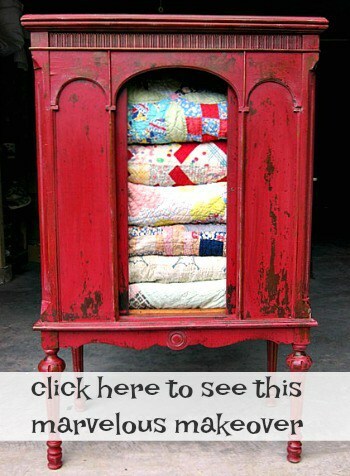 This is a great idea for my daughter apartment that i am re doing. Love your technical terms such as “thingy”? term I also use often. 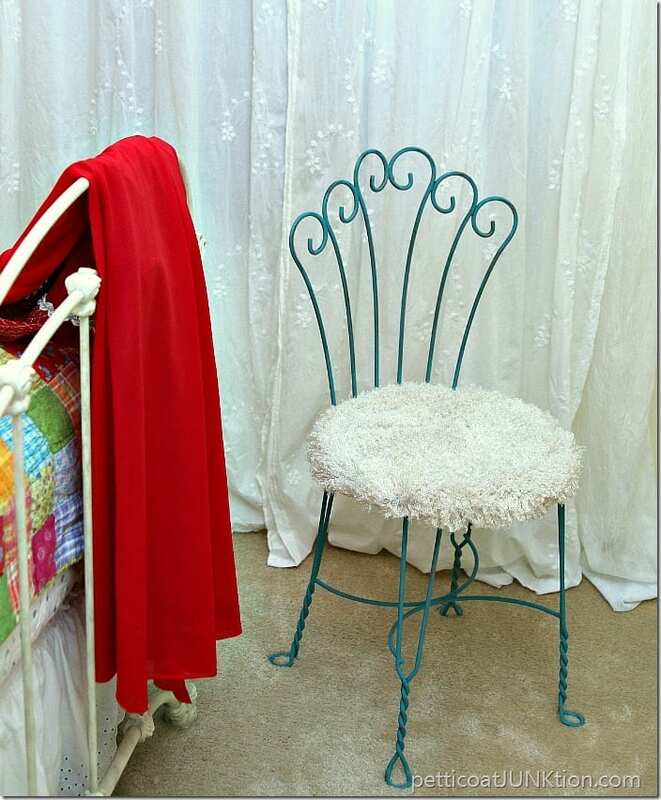 Very pretty chair makeover Kathy and it looks like your granddaughter has a gorgeous room too. Looking forward to seeing more of that space because the colors are beautiful! I just saw your post of “Drop cloth seats and white painted chairs,” via Hometalk and it was wonderful. 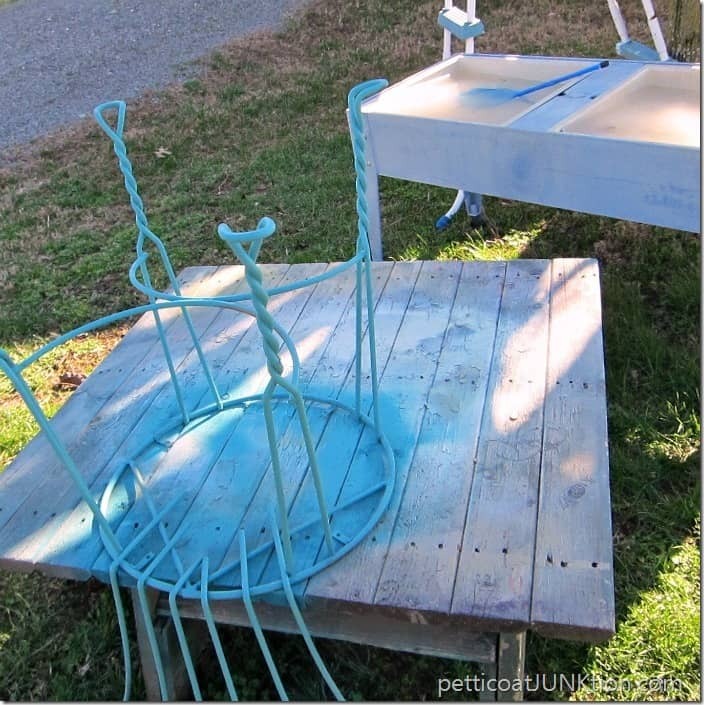 I moved to a new home just over a year ago and I began painting pieces of furniture that I have had for more than 30 years. I am so pleased because it is something that I have always wanted to do. I am just working on the seat cushions. I have a nice dropcloth all washed and ready to go. Perhaps I will make some curtains out of dropcloths as well. It is always nice to see someone’s creations to inspire me to get the job done. Now that Christmas is over I should get at my projects. Thank you for the inspiration and keep up the great work. That chair is darling! Isn’t it fun to live vicariously through our Grandbabies?! Love the turquoise & furry seats! Too cute! Very cute! I’m getting more in tune with faux fur – might even get a soft pillow! 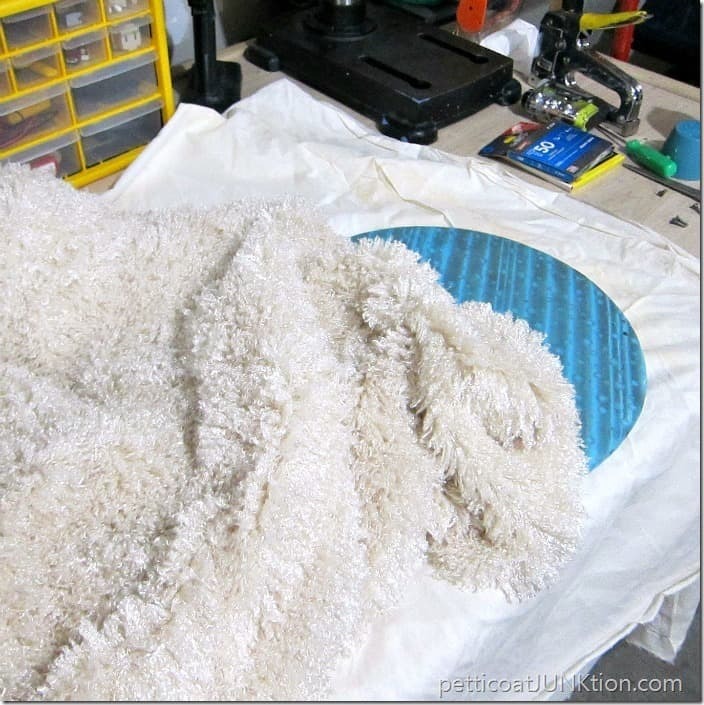 Some of the faux fur throws would be good for “cutting up” to cover other projects! Love the colorful quilt on the bed! Could you have used a toilet seat cover for the seat cover?